I have made this so, so many times -- and it is phenomenal. I typically make 3x this much (as long as I'm going to all the work!) and then freeze it in family dinner-size portions. I make the following changes (these amounts are for the regular-size recipe, without doing the 3x): add almost 1 tsp. 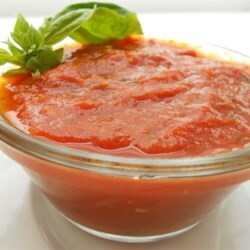 dried basil; use only 1/4 cup white wine; add 1 T. sugar; use canned, diced tomatoes instead of stewed; use only 2 T. olive oil. Although I made it once as just a marinara sauce (and it was excellent as such), I typically make this with meatballs; after forming the meatballs and browning them on all sides in a pan with about 1/2 inch of hot vegetable oil, I drain them and then throw them right into the sauce, where they finish cooking through while the sauce is simmering. Definitely adds a lot of flavor to the sauce. Yummy.